Astronomers studying a supermassive black hole at the center of a galaxy found proof that the winds blown by the black hole are sweeping away the host galaxy's reservoir of raw material to form stars. This artist's impression shows the outflow of molecular gas (red) in a galaxy hosting a supermassive black hole at its core. 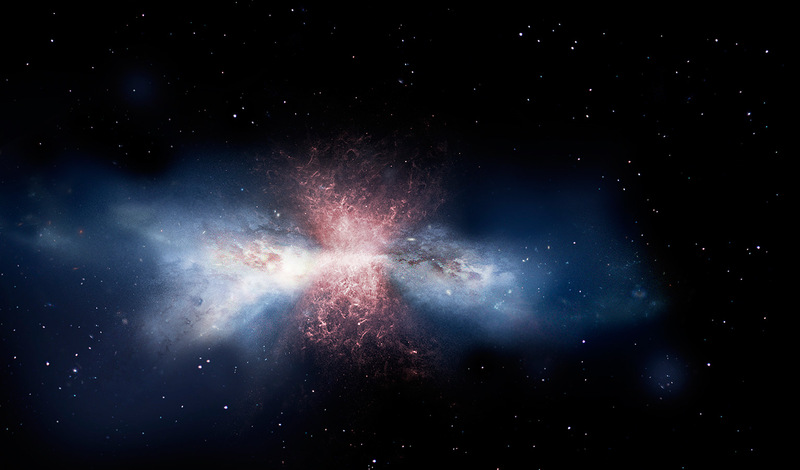 The study is based on data from the Herschel and Suzaku space observatories. If you are smart enough to run a simulation of the birth of galaxies, you are smart enough to count, and when you count, you end up with surplus stars in your model, compared to reality. Theorists have cooked up a grab-bag of explainers for the discrepancy, but until now there was no evidence to select the real cause. Now a group of astrophysicists has fingered a giant, super-speed wind bursting from a supermassive black hole found at the center of a giant galaxy. The study was performed on galaxy IRAS F111191 +3257, which is about 2 billion light years away, and therefore 2 billion years old. This ultra-bright, ultra-big galaxy (we won't repeat that name!) formed through the merger of two predecessors houses a “super-massive” black hole with the mass of about 1.7 million suns. Black holes are unimaginably dense structures that lurk at the center of galaxies, where they are obscured by gas, dust and stars. And because its gravity is too intense for light to escape, a black hole is invisible, by definition. As a disk of matter accumulates near the hole, a maelstrom of energy is released, causing an outflow of hot gas. That much was known. But was this outflow strong enough to strip away gas further out in the galaxy that would otherwise congeal into stars? That would bring theoretical star numbers closer to actual ones. 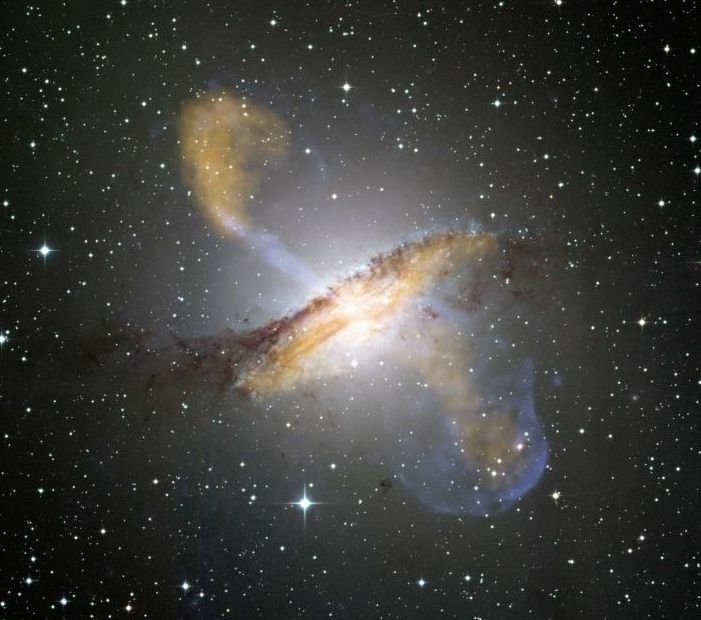 This image of Centaurus A shows a spectacular new view of a supermassive black hole’s power. Jets and lobes powered by the central black hole in this nearby galaxy are shown by submillimeter data (colored orange) from the Atacama Pathfinder Experiment telescope in Chile and X-ray data (colored blue) from the Chandra X-ray Observatory. First author Francesco Tombesi and colleagues observed the galaxy with satellites that see either X-rays or infrared light. To focus on events near the black hole, the group looked at extremely ionized iron, with all but one or two of the 26 electrons stripped away. That would be a telltale for some insanely strong conditions – exactly as expected near a black hole. "Material in the inner region of a galaxy is attracted by a black hole and forms a vortex, called the accretion disk," explains Tombesi, an astrophysicist at the University of Maryland and NASA. "It’s squeezed, crunched by the black hole and becomes very hot because of friction and it produces a lot of light." This radiation is strong enough to push material and create a wind. And sure enough, Tombesi's group identified signs of ionized iron with a telltale Doppler-shift toward blue, meaning the ions were moving toward us – at about one-quarter of the speed of light. Such a flow, observed at a distance of 1,000 light-years from the black hole, could push hydrogen gas and prevent it from congealing into stars, explaining the 20 percent shortfall in observations, compared to computer models. The discovery of strong winds from the black hole helps explain why simulations of galaxy formation produced too many stars. This artist's impression depicts a black hole accreting the surrounding matter through a disc (orange). 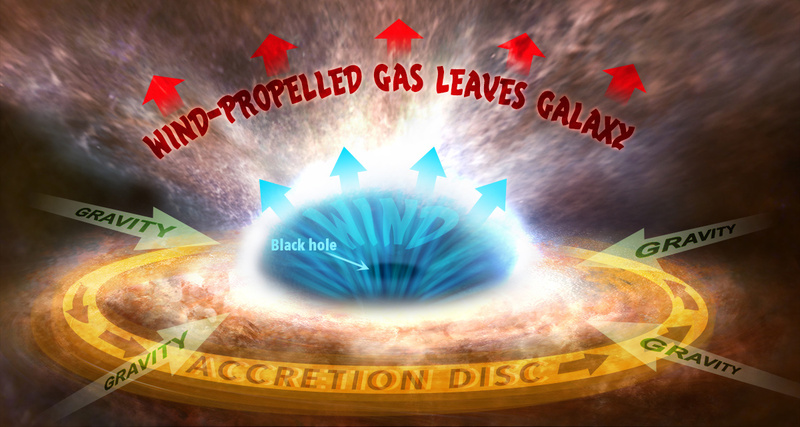 Part of the accreted material is pushed away in a wind (blue), which in turn powers a large-scale galactic outflow of molecular gas (red), which is no longer available to young stars. 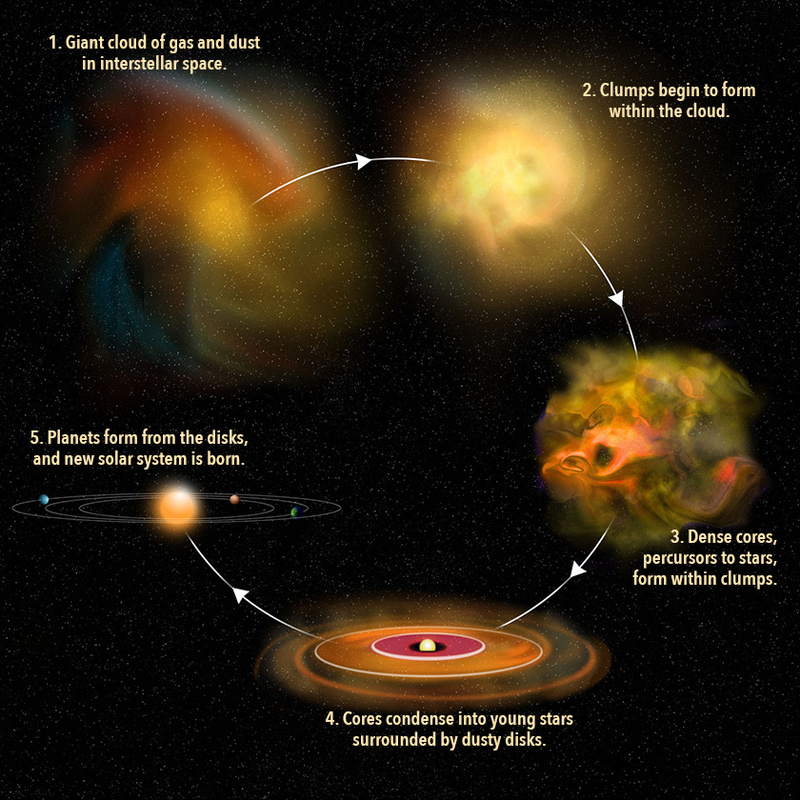 Stars are generally formed when a cloud of dust and gas collapses into clumps, which can begin to collapse further into a dense core and the precursor to a young star. In effect, the winds from the black hole are “feedback channels,” says Tombesi. “The galaxy provides food – in the form of gas – which flows through the inner region toward the black hole." Some of the gas gets sucked into the black hole and vanishes eternally, but some is returned toward its source in the outer galaxy. Such a process may occur in such an “active galactic nucleus” for several million years, very much more or less. "Galaxies all have collisions if you wait long enough," and the feedback process will apply to every galaxy after a collision, Tombesi says. The collision throws a lot of material into the inner region, and "Our Milky Way is on a collision path with Andromeda, and when the two collide something similar might happen." The project began with observations that refused to line up with computer simulations, says Tombesi. "The simulations were always over-estimating the amount of stars in massive galaxies. There was a need to find why the observations and theory did not match."